Students will learn how Azure App Service is used as a Platform as a Service (PaaS) offering for deploying cloud apps for web and mobile environments. Students will learn how to use App Service Environments (ASE) to host a dedicated environment for securing and running App Service apps at scale. Students will also learn how to use deployment slots as staging environments for web apps, that can then be swapped into production when needed. This course also teaches students how to scale up and scale out to meet and adjust for demand, and how bandwidth for web traffic can be optimized using Application Gateways and Content Delivery Networks (CDN). Students will also learn how to implement site connectivity for multiple scenarios including cross-premises and hybrid configurations, as well as extending on-premises networks into the Microsoft cloud over a dedicated private connection, using Azure ExpressRoute. Lastly, students will learn how to use Network Watcher to monitor and troubleshoot Azure virtual networks. 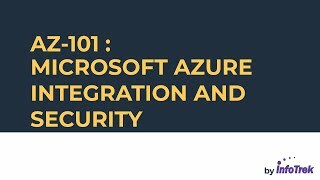 The course focuses on three key areas in the defense against attackers who target security vulnerabilities, resulting particularly from credential theft and compromised identities: Role-Based Access Control (RBAC), Multi-Factor Authentication (MFA), and Azure Active Directory Privileged Identity Management (PIM). Students learn to implement two-step verification to secure the sign-in process, as well has how to use advanced features like trusted IPs and Fraud Alerts with MFA to customize their identity access strategy. •	Use Azure Migrate to discover and assess on-premises virtual machine migration to Azure. •	Use Azure Site Recovery to migrate Hyper-V infrastructures to Azure. •	Implement use cases and configuration options for Azure App Services and App Service Environments. •	Manage and secure web apps with backup, restore, snapshot, and cloning. •	Optimize your web app performance with Scale Up, Scale Out, Autoscale, and Grow out strategies. •	Implement and configure Azure Load Balancer, Azure Traffic Manager, and Azure Application Gateway. •	Implement and configure Site-to-Site VPN connections and ExpressRoute. •	Implement and configure Network Watcher and troubleshooting common network issues. •	Use Azure RBAC to grant a granular level of access based on an administrator’s assigned tasks. •	Use Azure Multi-Factor Authentication to configure a strong authentication for users at sign-in. •	User Azure AD Privileged Identity Management to configure access rights based on just-in-time administration. •	Deploy serverless computing features like Azure Functions, Event Grid, and Service Bus.